Proper positioning is key to obtaining diagnostic radiographs. 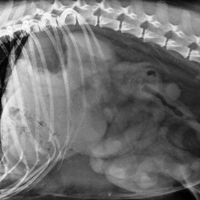 In this video, Megan Brashear, CVT, VTS (ECC), reviews proper thoracic radiograph positioning and safety. What a nice, patient dog!! Thanks for posting, I didn't know about the "2 fingers caudal from the scapula" trick - that is very helpful!